A Gloucestershire-based green energy company has become one of the first "bee guardian" businesses in the UK for its work to promote habitats. 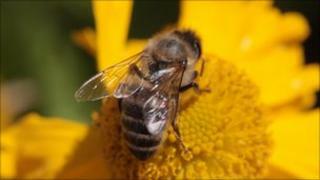 Ecotricity earned the award for its plans to create a "bee haven" at its new solar farm in Lincolnshire. The new 20,000-panel Sun Park is being planted with native wildflower seeds to encourage bees and insects to the site. Charity The Bee Guardian Foundation said it was brilliant companies were "realising the importance of bees". According to the foundation, the UK has lost 97% of its wildflower meadows in the past 70 years. And bee experts say nearly all of the UK's 250 species are in decline. Jessie Jowers, co-founder and managing director of the foundation, said: "It is brilliant that companies are realising that they can take action to really make a difference." Dale Vince, Ecotricity managing director, said: "Bees are under enormous pressure in Britain, as is all wildlife, and so the creation of these new habitats is vital. "We actually need to turn farmland back over to nature to redress the balance and that's what we're going to do." Ecotricity, which supplies electricity to 50,000 homes from a fleet of 52 windmills, will maintain the solar farm's wild flowers over the next 25 years. Bee guardian status can be granted by the Bee Guardian Foundation to anyone, from individuals and companies, to universities and schools.